Vacation rental - Near Plage du Midi, Cannes. Studio apartment close to the beach, with patio, pool and garage. Studio apartment, just next to the beach (Plage du Midi) situated in a large private park with swimming pool and direct access to the beach. Perfect for a family with children who will have large lawns and green space to play in. The pool (inside a child-proof fence) is open all day from 08:30 – 21:00. All in all, in a quiet and peaceful location. From the apartment, large glass doors will take you from the living room out to a small private garden terrace. The kitchen is well-equipped, including washing machine, dish washer, etc. You have a dinner table for 4-5 persons, that you can put out on the terrace. It is not hard to guess that the terrace will be your favorite place for both breakfast and dinner. Lunch can be enjoyed on the beach! Tiled bathroom with shower over bathtub. The apartment is newly renovated and in a very good condition. 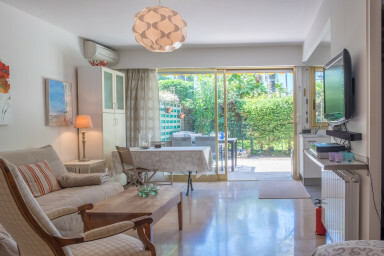 The apartment is located in residence San Remo Bungalow, just off the Plages du Midi, a few minutes walk from Le Suquet (the Old Town of Cannes), and about 15 min walk to the Palais des Festivals, Croisette, the beaches and all else that Cannes has to offer. A short 2-minute walk via the private park of the residence takes you to Plage du Midi where you will find a well-managed public beach. You will also find sections of the beach where you can rent a parasol, a mattress, etc. From the beach to the Palais des Festivals and further via the Croisette you will find a large number of restaurants, bars, from budget to very expensive.